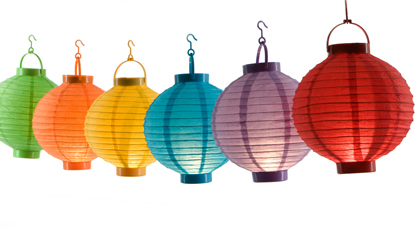 Colourful set of Chinese lanterns that would add an oriental flair to home and garden. Ideal for garden lighting, with a touch of the Far East, the paper lanterns soft glow would make magical outdoor party lighting. With small battery operated 2.5v 0.3 amp candles in the base, the Chinese lanterns can be used as indoor party lighting. Add a few joss sticks of warm incense to create a relaxing oriental ambiance in side your home as well as outside.